The 50-strong collection of original works was amassed by the late Dr Tom Rayner, an East Anglian GP who had a personal passion for Goodwin’s landscapes, preferring to keep his collection private. The group offered on March 23 at Suffolk saleroom Lacy Scott & Knight (20% buyer’s premium) was consigned to auction by Rayner’s wife and had adorned The Cedars, the family home and former village surgery in Kenninghall. Assembled over a 30-year period from the 1960s onwards, the collection mirrored much of Goodwin’s career. 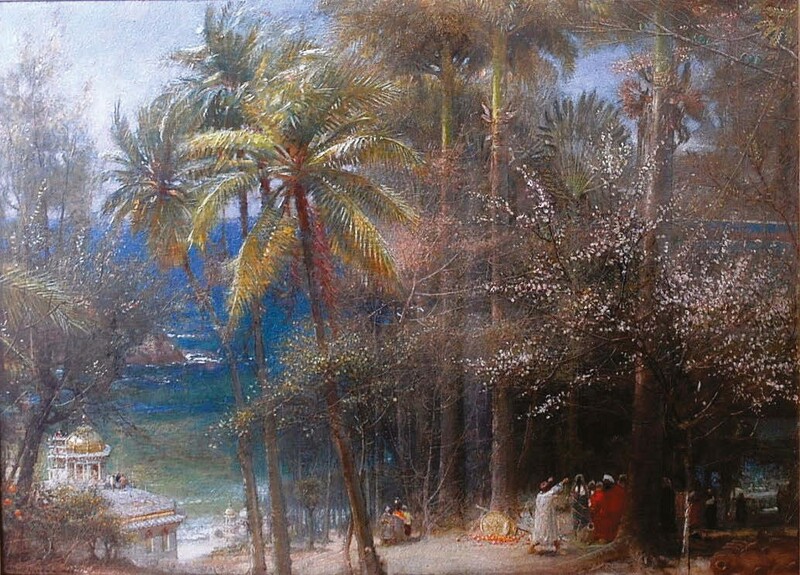 Spanning around 50 years of work from c.1870-1920, it contained a large number of the artist’s poeticised Turner-esque watercolour views of England and further afield, a clutch of oils and a small group inspired by stories from ‘the Orient’ and the Bible. Goodwin, the son of a Maidstone builder, showed great artistic promise from a young age, exhibiting his first works at the Royal Academy in 1860 at the age of just 15. He went on to become a prolific artist and one of the few Victorian painters who retained his popularity into the 20th century. 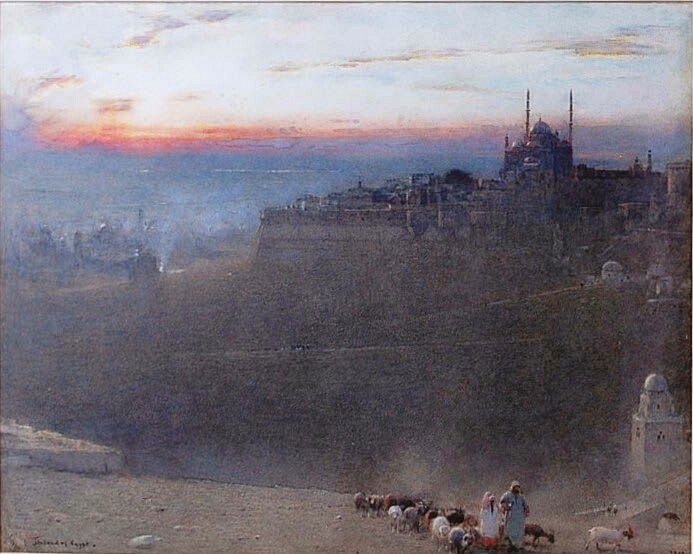 A protégé of John Ruskin, Goodwin travelled extensively throughout Europe as well as the Americas, India and New Zealand, and found inspiration in nature, the art of Turner and the Pre-Raphaelites. He often sketched en plein air and then completed his works from memory in the studio – sometimes many years later. On the secondary market, Goodwin’s art has long attracted an ardent following. Works are affordable for many collectors but can also fetch large sums for the very best. In 2001, a Sotheby’s sale of the Stanley Seeger collection included a romantic view of Venice titled The Afterglow – San Giorgio Maggiore and the Dogana, which soared to £225,000, more than 12 times above estimate. It was knocked down to Canadian collector David Thomson, son of the former Times Newspapers owner Lord Thomson of Fleet. It remains the most expensive work by the artist to sell at auction. The Land of Egypt – £7800. He described the quality of the collection as from “the upper end of the artist’s output”, with Middle Eastern and Indian subjects and those from continental Europe drawing the most money. While Rayner had a good eye for watercolours, his taste for 1970s-style framing and mounts was less discerning and it ultimately had some bearing on the overall price. Much of the collection had been bought from London dealer Chris Beetles, whose St James’s gallery has long specialised in Goodwin’s work. At the LSK dispersal, Beetles bought around two-thirds of the collection including the sale’s top lot, The Happy Isle of Salahat, a rare oil from Goodwin’s Arabian Nights series. The gallery plans to hold a substantial exhibition of the artist’s works later this year. The rest of the pictures went to a mixture of trade and private collectors, with the latter mostly securing English landscapes local to them. “In all there were three or four determined bidders, largely from the trade, who hammered it out for the lion’s share,” said Crichton. The Happy Isle of Salahat sold at £24,000, four times the top estimate. Signed and dated 1905, the 2ft x 2ft 10in (62 x 86cm) oil carried the biggest commercial clout of the collection and drew parallels with Ali Baba and the Forty Thieves (1901), which resides in the Tate’s collection. The second-highest price at LSK was Land of Egypt, a 17 x 22in (44 x 55cm) watercolour of an Egyptian citadel under a streak of blood-red sky, dated 1910, which took £7800 against a £2500-4000 estimate. 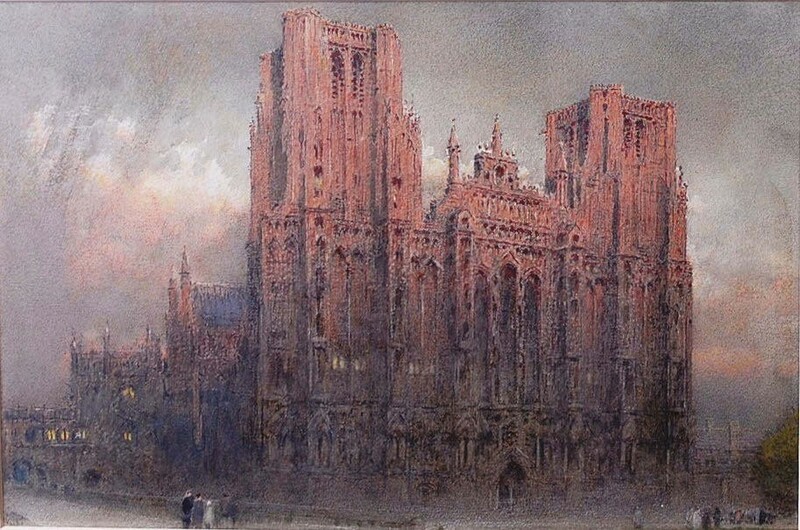 Among a range of more modestly priced English views was a 11½ x 17in (29 x 44cm) watercolour of Wells Cathedral in Somerset, dated 1917. With an old exhibition label for the Lowndes Lodge Gallery in London, it went to a US buyer on thesaleroom.com for £2600 against a £1200-1800 estimate.